How do you know what humor to use? How often should you use humor? How do you get started using humor? Using humor at work can seem intimidating but the reality is that you already know most of what you need to know if you understand the concept of food. Everyone’s sense of humor varies, just like their taste buds. For example, my taste buds like milkshakes and dislike beets. And yet, there are people who eat beats. That’s because different people have different tastes. This seems obvious to say for food, but it’s an important reminder for humor. A dish that one person finds bland may be far too spicy for another. Similarly, an example of humor that one person feels is innocuous may be very offensive to someone else. Generally, a person who has used inappropriate humor at work and a person who has cooked an unpopular dish have made the same mistake: satisfying their personal tastes rather than considering their medium, audience, and purpose. To get a better understanding of what humor to use, learn your Humor MAP. The food you eat on the run just so you don’t get a headache is different than the meal you serve to your in-laws to win their approval. Think about how your humor will be received, who will receive it, and why you are using it to better match your humor tastes with theirs. It’s possible for a human to go over three weeks without food. I’m sure it’s a miserable, awful three weeks, but it is possible. Eventually though, without food, they die. It’s also possible to eat a ton of food without no immediate ramifications, but after awhile the gluttony has negative consequences; non-stop eating leads to that terrible scene in Se7en. The frequency of using humor in the workplace is the same. Too little and you suffer from stress or boredom; too much and you’re not taken seriously. So how much is the right much? There is no exact prescription of how often you should use humor at work but, like food, it should be multiple times a day, sometimes in small quantities and other times in large amounts. 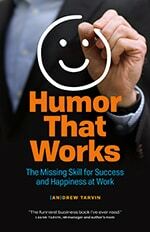 It all goes back to understanding the value of humor in the workplace and then using it to achieve specific goals. I will admit that I am a terrible cook. About the most advanced thing I can make is Pop Tarts. That’s not even putting them in a toaster, that’s just eating them raw. Eat Out. With no cooking skill at all, I can go to a restaurant where talented people who are skilled at cooking can make me something I’ll enjoy. Grab Pre-Made. Even if I don’t have time for a sit-down meal, I can still eat without having to cook. I can simply buy a pre-packaged meal, maybe do one or two things (like set the oven to 425 and cook the pizza rolls for 8-10 minutes), and I’m good to go. Follow a Recipe. Every now and then, I’ll try a recipe. I’ll follow a guide and adjust as I need to. It’s usually not as good as what I can get in a restaurant, but it gets the job done and I am getting better (though can we please scientifically define what a “dash” of something means?!?). Do It Yourself. The really good cooks, like my dad, can seemingly just wing it. No recipe, just a little planning (aka going to the grocery store or seeing what random ingredients happen to be lying around), some skill, and voila, a solid meal to be had. I’m not at this point yet, but could be in the future. Hire Out. You can hire comedians to write your copy so it’s funnier, or hire a keynote speaker to come amp up your event. Use Pre-Made. Using humor at work doesn’t mean you have to be the creator of humor, instead you can share appropriate office humor that others have created. Just make sure you give proper credit when you do. Follow a Framework. If you want to try creating your own humor it doesn’t mean you have to start from scratch. You can follow exercises like those found in my humor course and then adjust from there. Do It Yourself. If you have the skill and confidence, you can find your own ways to create humor for your job. Just think positive and inclusive and have fun. What a great analogy Drew! Absolutely LOVE this article! Thanks for all you do for the field of humor studies.